The pilot station of Golfe de Fos is located at Port de Bouc. The mandatory pilot area of Golfe de Fos is bordered to the west by the Faraman lighthouse meriden, to the east by the Cap Couronne meridien and to the south by the by the parallel 43° 19’ north. It includes the canals, the basins, the interior ports and the Rhone as far as Arles (Km 279) , the Canal de Caronte and L’Etang de Berre. -more than 70 meters long, other than those transporting oil cargo or dangerous goods, to or from container terminals of sheltered dock 2 and 3. -more than 50 meters long of all categories, desiring to anchor in the mandatory pilot area. The pilots of the Marseille/Golfe de Fos stations, are among other things, to exercise coastal piloting above this zone. 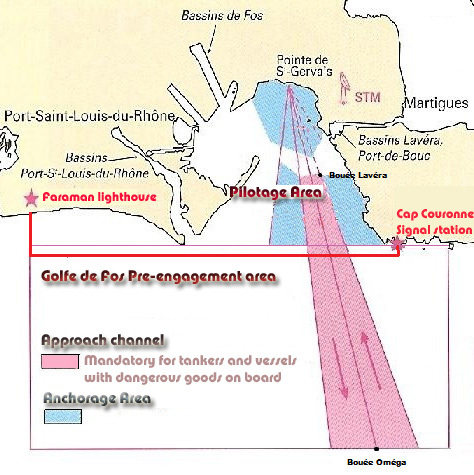 The vessels with Ports du Golfe/Fos as their destination must address their HPA to the port authority (STM) of Port de Bouc at least 24 hours in advance or from their departure from the previous port. Approximately one hour before their arrival in the Golfe, after having mandatorily contacted FOS PORT CONTROL on channel 12 the vessels must establish the VHF link with the pilotage on channel 14 in order to convey the probable time of arrival and the pilot’s embarkment position. The pilot station guarantees a permanent watch on channel 14. The pilotage is guaranteed day and night. The pilot embarks to the south of the floating buoy of Lavera (43°22.5’N – 004° 58.15’E ) at a distance agreed upon with the pilot station.